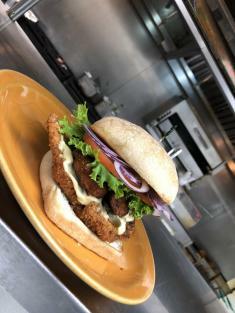 Tenderized pork loin, seasoned, hand breaded and fried to perfection, topped with shredded lettuce, sliced tomatoes, raw onions & sriracha aoli. House made pastrami served on toasted marble rye with Swiss cheese, sauerkraut and thousand island. Subsitute turkey to make a Rachel. 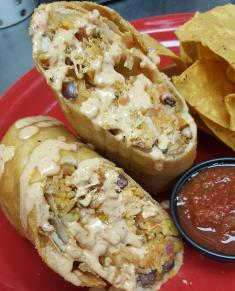 House roasted shredded beef or chicken, cowboy caviar, pico de gallo, cheddar jack cheese & spanish rice wrapped in a flour tortilla, fried to perfection and drizzled with chipotle ranch. 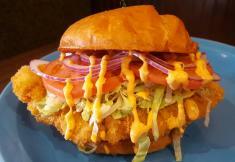 Served with corn chips & salsa. Tender sirlon topped with melted mozzarella, mushrooms, crispy onion strings & french onion sour cream served on toasted wheat berry bread and pressed on the flattop.